RMAX GeoFoam was extensively used as an inert non-biodegradable fill material in a major urban renewal project in Barangaroo, Sydney. One of the most ambitious urban renewal projects in the world today, embodying world-class design excellence and sustainability, the waterfront renewal on the 22-hectare, $6 billion Barangaroo precinct will help redefine the western edge of Sydney Harbour and showcase Sydney as Australia’s gateway to the world. A number of RMAX construction products were used within the landscaping and buildings in this landmark development. 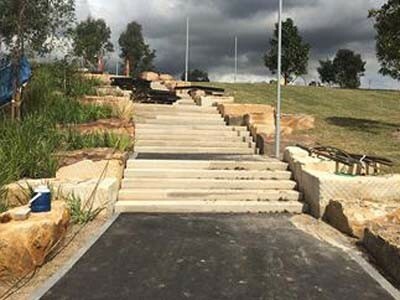 Over 2000 cubic metres of high density expanded polystyrene RMAX GeoFoam were used extensively by Lend Lease’s civil contractor, installed over six months of construction as an inert non-biodegradable fill under the new public park area. RMAX worked closely with the engineering design team to ensure RMAX GeoFoam met all of the load requirements, saved time and reduced cost on the project. Widely used in civil construction, RMAX GeoFoam has a cellular structure that helps to absorb and dissipate crush loads; its cellular structure results in isotropic physical properties, i.e., the physical properties are the same in all directions. A high performance expanded polystyrene (EPS) fill material specifically designed for civil engineering and commercial building construction, RMAX GeoFoam offers remarkable strength-to-weight ratio, making it ideal for absorbing heavy structural and mechanical loads and reducing underlying soil stresses. These capabilities make the EPS fill material suitable for stabilising roads, steep embankments, bridge abutments and sensitive below ground pipework. RMAX GeoFoam is also a highly versatile material that can be used as a quick and easy cost-saving method for concrete formwork or weight reduction on foundations. Key benefits of RMAX GeoFoam include excellent compressive strength; reduced construction times saving costs; durable and non-biodegradable material; ability to inhibit water absorption; safe, non-toxic, environment-friendly material; application versatility in concrete formwork and several civil construction jobs; and greater design flexibility.